END OF of Financial Year is fast approaching and with it a chance to say, "Out with the old, in with the new, used or reconditioned." In the lead-up to tax time, many businesses find themselves examining the books, looking for ways to make the most of their tax offsets and budgeting requirements. Capital expenditure is one simple way businesses can make greater savings and strategic investments in an effort to boost their bottom line. When it comes to purchasing heavy machinery, you want to make sure you’re buying the best machinery to suit your needs. After the announcement of the latest Federal Budget 2017/2018, it appears the Australian Government is backing small and medium businesses, investing in the future growth of the industry and funding for major infrastructure projects. For industries like ours at RDW, major projects such as rail lines, ports, electricity, and pipelines will see a shift in demand towards machinery needed to complete these projects. The Government claims the "delivery of further investment in infrastructure across our cities and in our regions will ensure the benefits of Australia’s economic growth are shared broadly across the country" (Budget, Australian Government, 2017). Many small business owners will get to enjoy instant tax offsets for another year. Treasurer Scott Morrison has increased the benchmark for small businesses; those that turn over less than $10 million each year will be able to immediately write off expenditure up to $20,000 (McGhee, Ross, and Elvery, ABC News, 2017). This has extended upon last year’s budget, which was previously set at businesses that turnover under $2 million each year. For the construction, heavy machinery, and civil engineering industries this promise will open up a wide range of opportunities. If your business now falls under the new tax offset bracket of $10 million revenue, you will be able to qualify for these benefits come the start of the new financial year. Tax offsets like those proposed in the Federal Budget will help you invest in your fleet to improve the productivity of your business in the new financial year. For smaller businesses who earn under the current threshold of $2 million, it makes sense to invest in your machinery needs prior to the end of this current financial year period. It’s important to remember that parts supplied for repairs to your machine can be written off instantly; therefore, fixing your machine now before the end of the financial year is a very wise business decision! For large businesses who will meet the new $10 million threshold, it pays to start planning your capital expenditures for the new financial year now that greater offsets are available to you. You will soon be able to write down the full cost of these expenses and investments against your profits when purchased before tax time. This includes machinery and extra items, such as attachments, new, used, or old machinery and new, used, or reconditioned componentry. 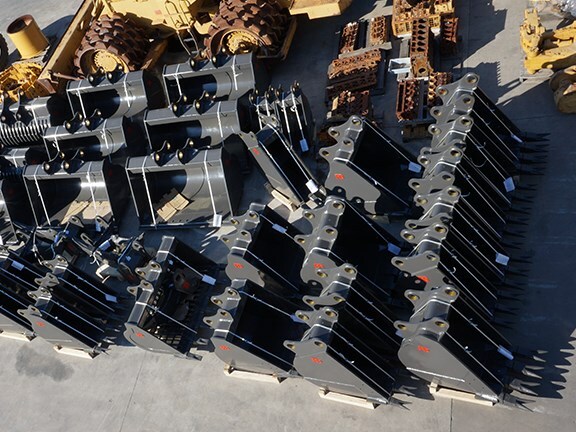 If you are buying a new machine over $20,000, buy your quick hitch, buckets and other attachments separately from your machine through a separate supplier (consider us, at RDW) and they can be instantly written off instead of over several years. RDW are not tax advisers; therefore, we suggest you seek financial advice from the professionals prior to any tax related purchases made.